Terraza 7 hosts a 17 piece big-band. 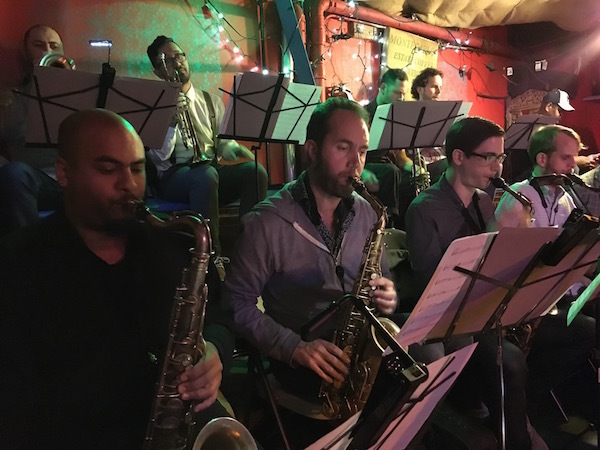 Comprised of New York musicians of the highest caliber, many of them regular performers at Terraza, this group brings the big-band to Queens and bring Queens culture to the big-band. Performing primarily new works by the co-directors, Edward Perez and Michael Thomas, the group begins reading sessions open to the public on Thursday, June 4th. Enjoy a rare opportunity to witness the beginning of a brand new group unlike any the hanging stage has ever seen. Terraza 7 Big Band at Terraza 7 on Thursday, May 4th, 2017 at 9:00 pm.